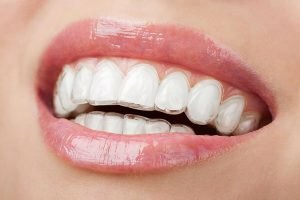 Invisalign is a very popular orthodontic treatment for individuals who want to improve the alignment of their teeth for a better smile appearance. Invisalign is one of the most advanced clear aligner systems available. It uses a series of clear and removable aligners to guide your teeth into their proper place, gently and gradually. The clear aligners, which are like thin versions of a mouthpiece, must be worn at least 22 hours each day. They can be removed when eating or cleaning your teeth. Bondi Dental takes pride in offering the latest treatments in dentistry. This includes advanced orthodontic solutions such as Invisalign. Invisalign is a good option for many orthodontic patients, even for those who are good candidates for traditional braces. Teens – the aligners are ideal for teenagers who might be a little uncomfortable and self-conscious wearing metal braces. Spacing issues – patients with improper spacing between the teeth, especially crowding can benefit from Invisalign. However, patients with small teeth and big arches are better suited for dental veneers. Patients who struggle with their oral hygiene routine – cleaning your teeth can be challenging with fixed metal braces. With Invisalign, you can easily remove the aligners, so you can rinse, brush, and floss your teeth normally. Patients with good overall oral health – if your dentist determines that your teeth and gums are healthy and if you don’t smoke, then Invisalign may be recommended. Your Bondi Dental dentist will create a 3D model of your mouth with the help of X-rays, digital images, and teeth impressions. The model will be used by the dentist to create tailored plan to move your teeth into their ideal position. The Invisalign Company will use the model of your mouth to start manufacturing a series of clear aligners customised for you. Your dentist at Bondi Dental will provide a new set of aligners every two weeks. If you’re not comfortable with traditional braces, you can opt for Invisalign at Bondi Dental. The Invisalign Clear Aligner System is virtually invisible, removable, gentle to teeth, and comfortable to wear. Learn more about Invisalign and what it can do for your smile! To claim your FREE Invisalign consultation call us on (02) 9365 7187 or request your appointment online today !